In 2012 I worked on concepts for an interactive exhibit for the National Maritime Museum in Greenwich, London. In one corner of the main hall there is a collection of painted wooden figureheads that were once attached to the prows of various sailing ships. At the time the museum had a static display about the figureheads but they wanted to make the exhibit more interactive and attractive to visitors. 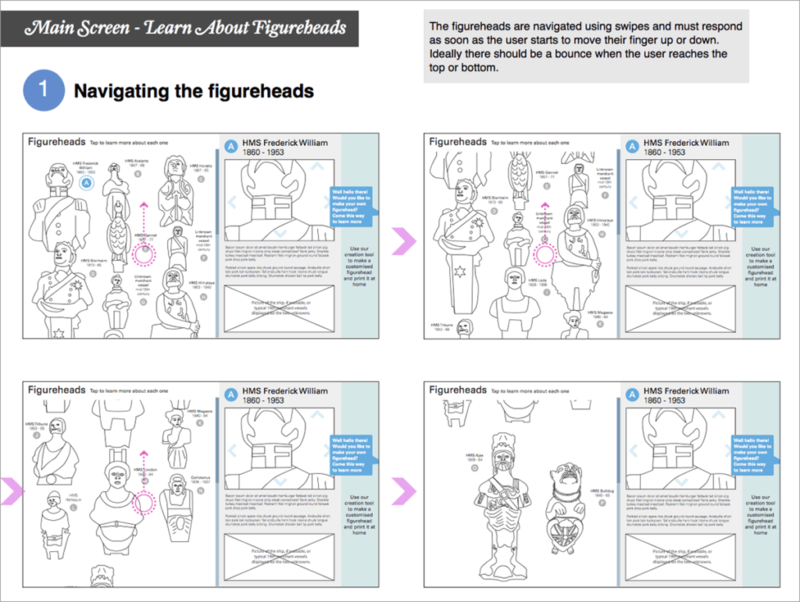 As well as detailing the history of the figureheads, the plan was to allow people to create their own special figurehead from parts of the real ones and then allow them to save their creation as a papercraft model and either send it to themselves via email or print in the museum. These figureheads could then be constructed and even attached to the prow of a model ship purchased in the museum shop. 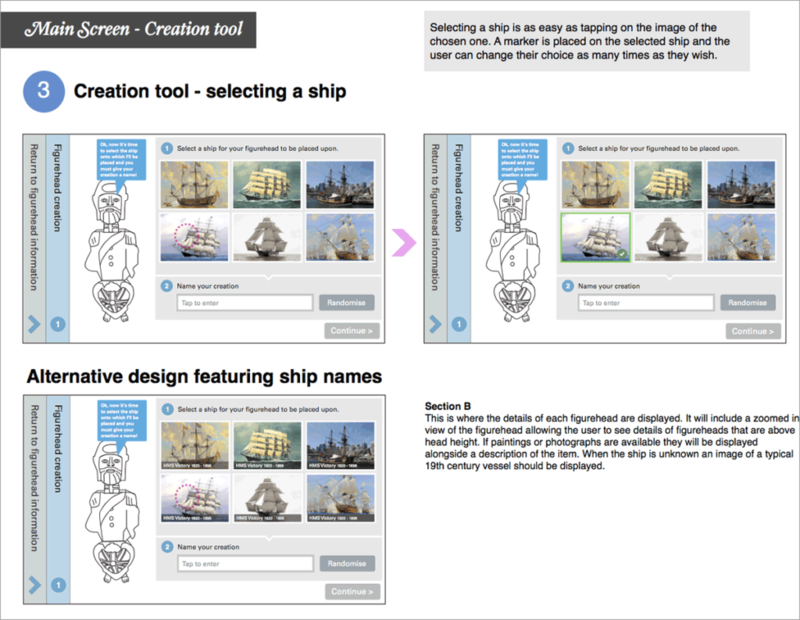 I worked on UX flows and concepts for the exhibit, which included a touch-screen drag and drop figurehead creation tool. One of the challenges was making sure the exhibit appealed to museum guests of all ages and also catered to those who just wanted to learn about the figureheads (not make their own). A proposed solution to this was an attract screen that had a clear incentive to younger guests but didn’t deter others. Unfortunately the exhibit implementation was delayed for various reasons and ultimately never happened. Two photos of the exhibit of figureheads as it existed in the corner of the main hall of the museum. On the right is the static content detailing their history. 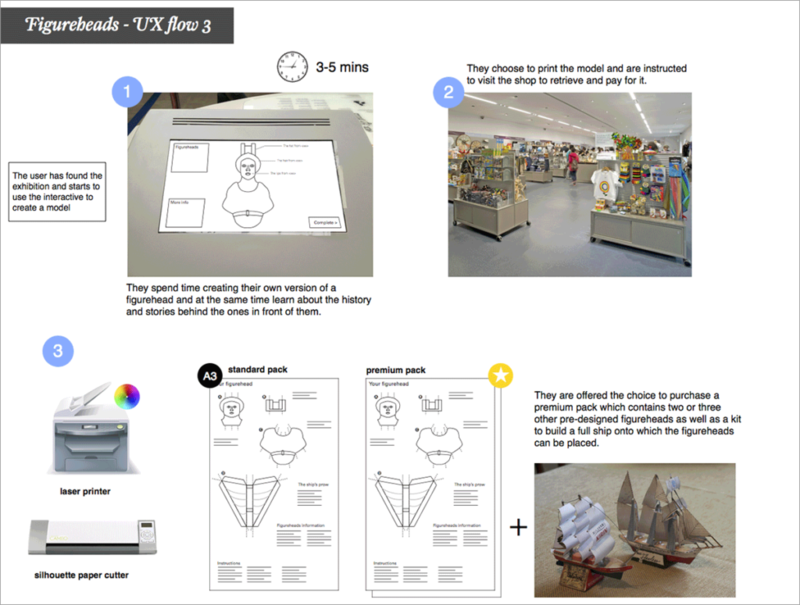 An excerpt from one of the UX flows for how the exhibit could work. In this case it includes details of printing the newly created figurehead in the museum and a possible purchase of a model ship to complement it. As well as a figurehead creation tool the interactive exhibit also had to cater to museum guests who just wanted to learn about the existing historical items on display and this is an example of how that interaction could work. 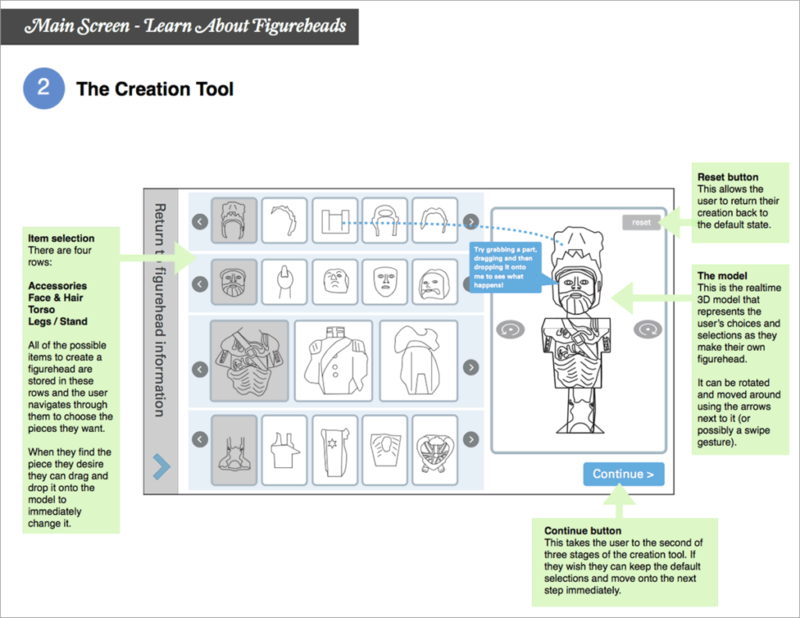 This is one version of the figurehead creation tool featuring annotations detailing how each section would work. The idea was that museum guests would select and mix and match parts of the historical figureheads to make their own special creation. 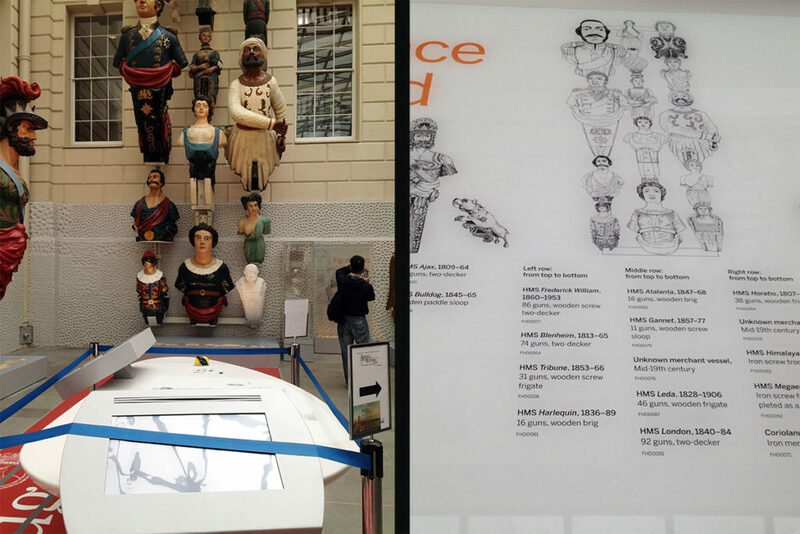 It was decided that the newly created figureheads could also be attached to the front of a historical ship that would then be ‘launched’ on another interactive exhibition in another part of the main hall. This is a concept for the ship selections screen. 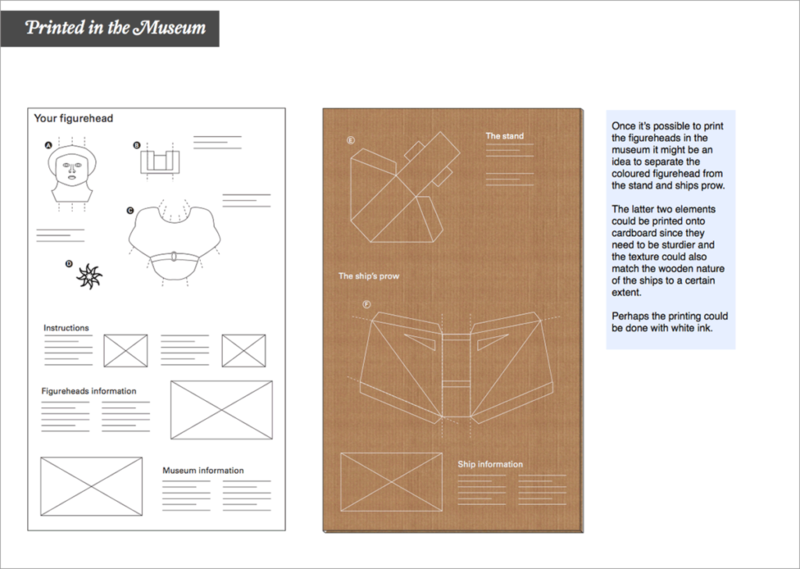 This screen would appear towards the end of the creation process and would be used in the event that guests were unable to print at the museum itself. 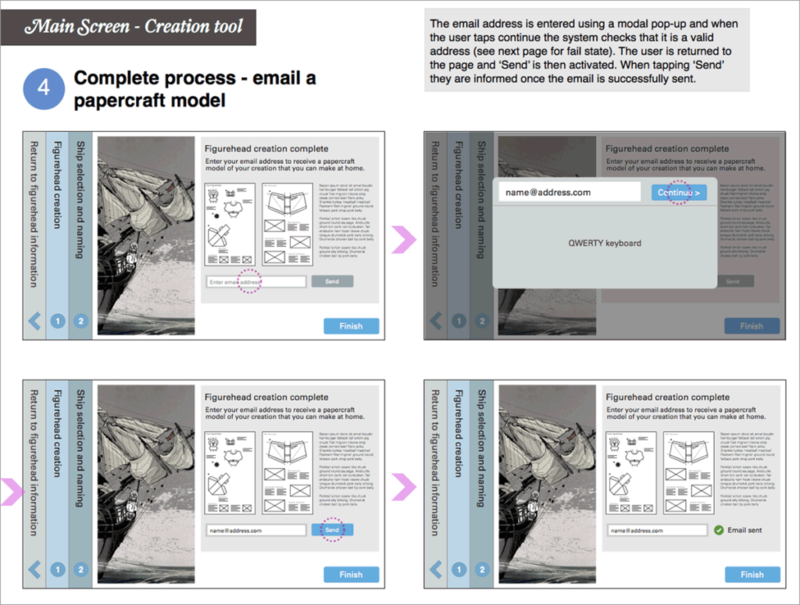 In this case they are able to send their creation to themselves via email. Details of how the figurehead creation could be printed in the museum, including part of a ship’s prow onto which it could be attached. 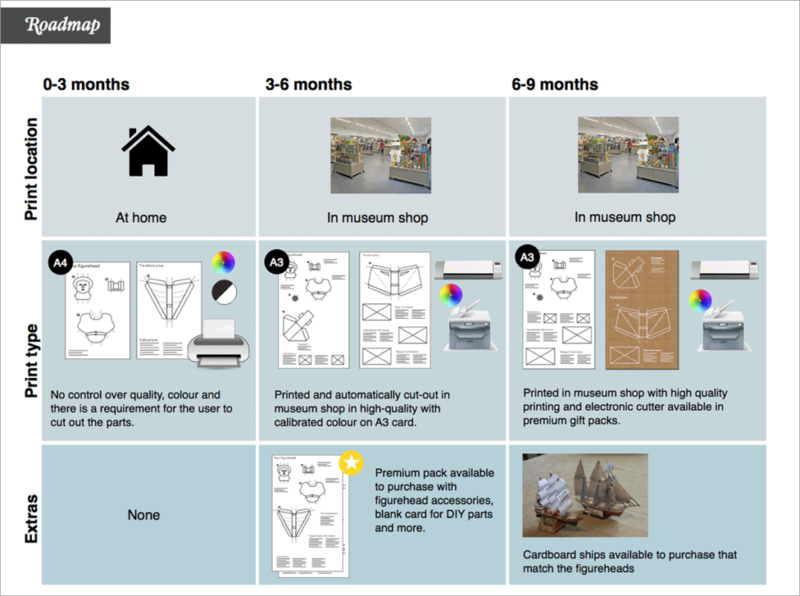 This was a proposed roadmap to show how the exhibit could evolve over time because it was unlikely that the infrastructure would be in place in the museum to support all features to begin with.